Scarab beetles, because of their size, numbers, and beauty, have played various roles in their interactions with humankind. The principal types of human use of scarabs have been religion and folklore, folk medicine, food, and ornamentation of regalia. Certainly, one of the most impressive roles of scarabs in human culture is the symbolic role of dung beetles in the Egyptian civilization, 3,000 B.C. Collectively known as the sacred scarab, these insects and their ball-rolling behavior symbolized certain parts of the Egyptian theory of the universe. Ra, according to Egyptian theology, was the Sun God responsible for the daily shepherding of the sun across the sky. Ra, was also the first ruler of Egypt. A cult developed whereby Ra was symbolized by the scarab, and the sun was represented by the dung ball. The scarab pushing its ball was an earthly symbol of Ra escorting the sun on its daily journey across the sky. The setting of the sun was also correlated with burial of the dung ball in the earth by the scarab. Observing a scarab emerging from a corpse-like mummy (the developmental stage known as pupa) was likened to rebirth. Egyptian priests thought that whatever happened to the sun under ground (after it set) was essentially the same as scarab metamorphosis. The sun entered the ground at the end of the day as did the scarab and ‘‘his’’ ball of dung. The sun then traveled underground from west to east while undergoing a metamorphosis that resulted in regeneration the following morning when the sun rose again from the ground as the scarab god Khepri. If the scarab and the sun could be reborn from the earth after death and transformation, why could this not then be possible for humans? It has been said that the beetle’s pupal stage inspired the process of human mummification! The mummy was the imitation of the scarab pupa, which was a temporary condition prior to rebirth! The use of scarabs in traditional folk medicine has been and remains widespread in Asia, especially China. It has been reported that in Laos dung beetles were used as a medicine for diarrhea and dysentery. Roasted, pulverized beetles and a little powdered calcium and saffron were added to water which was to be drunk. The calcium carbonate component of the concoction would be helpful to an upset stomach. Note, however, that dung beetles are intermediate hosts for tapeworms, helminths, and pathogenic bacteria! Nevertheless, dung beetles continue to be commonly used in traditional Chinese folk medicine for many ailments, especially for the treatment of cancer. The most widespread human use of scarabs currently is as food. Using insects as food was arrived at independently in numerous societies. While many natives are selective with insects and will eat only certain kinds, others will eat almost any insect they can catch. The larvae (commonly known as grubs) and occasionally adults of larger scarabs seem to be most favored as food items because of their size. Some cultures eat them roasted over coals or on a stick, and others eat them fried or raw. Usually, this practice takes several steps, the gathering of the scarabs, cleaning (that some times takes 1-2 days), preparation (when eating adult scarabs, the custom is to remove the head, thorax, legs, and wings), and finally the cooking process of choice. 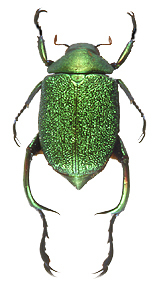 Some scarab beetles are sold as delicacy at local markets. Around the world, scarabs have been used as ornamentation, in the form of carved jewelry or amulets with scarab shapes or by using the actual scarab beetles or their parts to decorate head-pieces, necklaces and other accessories. This is a consequence of the beauty of these insects as well as the symbolic value they have in human cultures. Today, the use of scarabs is shown in jewelry, candy, drinks, postage stamps, even cars like this 1939 model on the left. Modern people try to integrate scarabs in their lives as pets, tatoos, and sculptures that represent some of the most beautiful scarab beetles. Resource: Brett C. Ratcliffe. 2006. Scarab Beetles in Human Culture. Coleopterists Society Monograph Number 5:85-101. 1. Photo courtesy of Egyptian Museum of Cairo to Brett Ratcliffe. 2. Photo by Mike Klein. 3. Photo by Brett Ratcliffe. 4. Photo by Stephan LeTirant. 5. Photo courtesy of Shogakukan, Inc., Tokyo, Japan to Brett Ratcliffe. 6. Photo by Brett Ratcliffe. 7. Photo courtesy of Brett Ratcliffe. 8. Photo by German Amat. 9. Photo by Brett Ratcliffe. In South America, natives from the Amazon basin make beautiful necklaces using the hard wings (elytra) of these gorgeous scarab beetles called Chrysophora chrysochlora. Click below to download the worksheet to build your own scarab necklace!